^ Barsanti, Chris (18 November 2016). "'Manchester By the Sea' Is a Tragedy Bursting With Life". Retrieved 22 January 2019 – via www.popmatters.com. ^ Plante, Chris (18 November 2016). "Manchester by the Sea is a beautiful tragedy, and Casey Affleck's finest role". Retrieved 22 January 2019 – via www.theverge.com. ^ "God removes shame, even that of Lee Chandler". Abilene Reporter News. USA Today Network. 10 March 2017. Retrieved 22 January 2019. “Manchester By the Sea” is no romance. It is a tragedy that slowly unfolds through flashbacks in the mind of Lee Chandler, the main character played by (Casey) Affleck. ^ Chitwood, Adam (8 October 2018). "Matt Damon Reveals the Original 'Manchester by the Sea' Ending That Was Too Expensive to Shoot". Collider. Retrieved 9 October 2018. ^ Bakare, Lanre (24 January 2016). 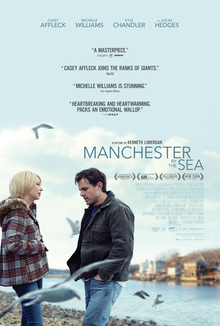 "Manchester by the Sea review: Kenneth Lonergan's morose echo of Margaret". the Guardian. Retrieved 31 August 2018. This page was last edited on 11 April 2019, at 20:00 (UTC).